'Twas the night before Christmas, and all through the house ... For decades families have gathered together to read Clement C. Moore's enchanting holiday poem. Featuring beautiful original illustrations by award-winning artist Tom Browning, this stunning edition stands apart from the rest. Browning has created a classic Saint Nick--the quintessential round, jolly, white-bearded figure that everyone imagines. The look is timeless, filled with warmth and sentiment: exactly what Christmas should be. 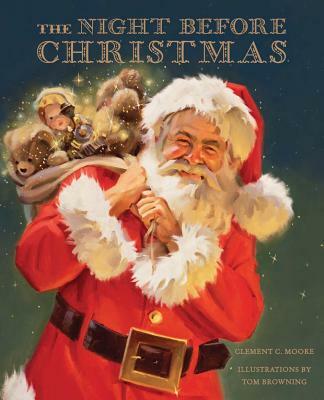 The story's enduring charm and Browning's memorable art make The Night Before Christmas a must-have for any child who is just discovering the tale--and every adult who has loved it forever. Tom Browning is a nationally acclaimed and award-winning artist known for both his Santa images and his fine art, which includes a wide array of subjects. His paintings of Santa Claus have been licensed for countless products with global distribution and are now famous around the world. Although Tom now spends his time primarily painting fine art, he continues to create several Santas each year and to add them to his private collection. Tom lives in Bend, OR. For more information, visit his website at tombrowning.com.